Residents along the Beartooth Front will nod knowingly as they read about a referendum being held today in Johnson County, Illinois. It’s a familiar story of community dynamics. Shall the people’s right to local self government be asserted by Johnson County to ban corporate fracking as a violation of their rights to health and safety? A grassroots citizen group called Southern Illinoisans Against Fracking Our Environment (SAFE) was responsible for collecting the signatures to get the proposed measure on the ballot, supported by the Pennsylvania-based Community Environmental Legal Defense Fund (CELDF). A coalition opposing the measure is led by one of the elected County Commissioners, and has significant support from the oil and gas industry. We won’t get too deep into the community politics here, except to point out a potential nominee for the Rex Tillerson Fracking Hypocrite Award. 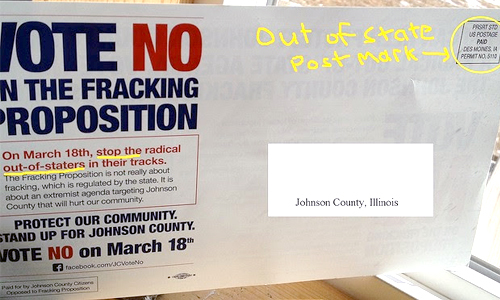 The opposition is claiming that the initiative is being led by “out of state interests,” so they sent out a mailer demanding to “Stop the radical out-of-staters in their tracks.” Trouble is, the postmark on the mailer is from…out of state. We’ll report on the outcome of the vote as soon as we get it, but the main reason I wanted to post this is to show the power of taking the out-of-staters out of the campaign and making it about personal appeals from local voters to each other. The video below, recorded by local resident Tony Gerard, has gone viral in the area. It’s a very powerful statement — not slick or professional, and probably too long, but honest and heartfelt. It’s a lesson we can all learn about the power of social media to persuade through personal appeals in rural and small town environments. Beartooth residents, take heed. This entry was posted in Community Organization, Politics and History and tagged fracking ban, fracking Illinois, fracking video, Illinois, Johnson County, personal appeal, Rex Tillerson Fracking Hypocrite Award, Tony Gerard. Bookmark the permalink.